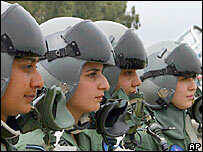 The Pakistani Air Force (PAF) has inducted four women as fighter pilots for the first time. The women were part of a batch of 36 cadets who were awarded flying badges after three years of gruelling training at the PAF academy at Risalpur. Being a fighter pilot has until now been a purely male domain. Women could join the armed forces but only for non-combat jobs like the medical corps. 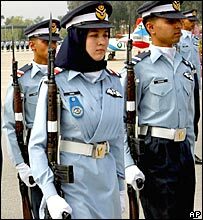 Three years ago the PAF decided to allow women to train as fighter pilots. It was a passing out parade with a difference. 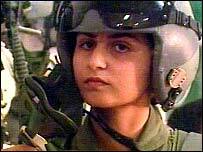 Never before had any woman been part of the batch of fighter pilots being awarded flying badges. And the difference was recognised by the vice chief of the army, Gen Ahsan Saleem Hayat, who handed out the certificates of honour to the successful men and women cadets. Expressing his delight, Gen Hayat said the air force had taken the lead to induct women in the combat units of the armed forces. When the BBC visited the training academy nearly a year ago, the first batch of four women cadets had just moved on to fly jet-engine planes. There were six others who were in the second batch and a few others in the aerospace unit. Although these trailblazers were few in number, many instructors admitted their presence was already being felt. One of the female cadets and now a fighter pilot, Saba Khan, then told the BBC that joining the air force to become a pilot was like a dream come true. Other female cadets were equally excited. At the passing out, one of the graduating women flying officers, Nadia Gul, received the trophy for best academic achievement along with two of her male colleagues who got trophies for best flying performance and general duties. The air force academy is still male-dominated, and it is not clear what the real feelings of the male cadets have been to the induction of women into the fighter pilot programme. Officially, most have welcomed the move. Even so, the fact that four women are now officially fighter pilots is a clear indication that the new policy of opening up the combat units of the Pakistani armed forces for women is here to stay.